Does Royal Jelly Make Royal Queens? School kids need a new lesson about royal jelly. The kids in the Grade 5 classroom knew all about royal jelly. And so it is. We think. Royal jelly – countless journal articles (and Wikipedia) tell us – stimulates the latent she-ness in a female larva. It removes her from a future life of weary drudgery as a worker destined to live six short weeks, then die wedged between some dusty stigma and anther. Royal jelly gives the lucky larva a future life as a queen employed in monotonous drudgery as an egg-laying machine destined to deposit progeny for three years in a crowded dark den, then die in a palace coup. There’s not much of an advantage in the queen’s life. But it’s longer. And there must be a crown or something that comes with the job. Caught in the middle with bees! Starting out, the first two or three years, it seems easier, safer, and more financially prudent to simply buy queens from the local association prior to making spring splits. 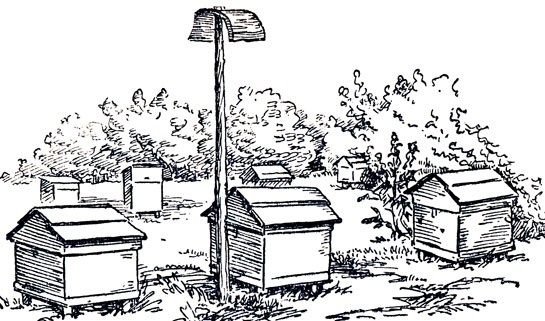 If you have 2 or 3 hives that need splitting it’s not too costly and ensures a greater degree of success to buy the queens and make splits installing the purchased queens. It almost always results in a good outcome. I’ve been resistant to rearing my own queens for the past couple years although I know I should have been doing so. I’m not quite sure if I’m just lazy, busy with other bee projects, afraid of failure, or just not interested in queen rearing. But, at last, it’s time. I’m not sure if my eyes are good enough anymore for grafting. I thought about buying some of those jeweler’s or watchmaker’s glasses. But then I’d also be buying more dedicated queen rearing equipment as well. Cell punching helps and I’m waiting for a class which may convince me to adopt a simple grafting method. Regardless, most all the grafting methods neccessitate multiple boxes, transfers, more bee stuff and can be a bit pricey. Simplier (non grafting) equipment like the Nicot or Jenter systems are also costly. On the other extreme is the walkaway split, making sure the queenless split has larvae of appropriate age and allowing the bees to make an emergency queen. Additional methods of cell crushing can be added to improve the outcome but making multiple walkaway splits is a bit scary – what if half of them don’t make it? I’m a little OCD and looking for a little more control and perhaps even better outcome. So, remembering the low tech methods of our forefathers, and with a mind to keeping costs at a minimum, I decided on using one of the throwbacks like the Miller or Hopkins methods. A mentor once suggested the Hopkins method to me and it sounds easy enough and promises to raise more queens than I’ll need. Basically it involves taking a frame of appropriately aged larvae and placing it horizontally over a densely populated queenless split. It’s low risk as well, if all goes poorly, such as a sudden change in the weather, the worst that can happen is I re-unite that split with their parent colony. So that’s what I’ve decided to attempt this year. 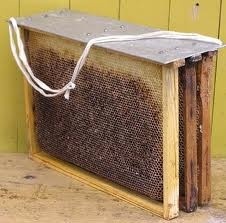 Another adventure in beekeeping! Above are pictures of the 2″ shim I’ll be using to place the frame over the colony. Also a link below if you’re interested in reading more about the Hopkins method of queen rearing. Royal jelly, which also is called “bee milk,” looks like white snot. More than half of it is water, the rest is a combination of proteins and sugars. Special glands in the heads of worker bees secrete the stuff, which gets fed to babies. A developing queen bee is fed royal jelly exclusively—not pollen and honey like her proletarian sisters. Some describe withholding royal jelly from worker bees as nutritional castration. 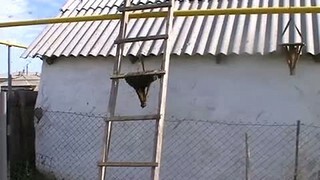 These bees don’t get the special Food of the Gods. Or, perhaps, food of genetic monarchies. And so, we thought, their ovaries shrivel, and they don’t become a queen. Read more here. Winter is a quiet season for beekeepers, so what better time to make yourself a steaming mug of cocoa and settle down to two great podcasts about bees! The first podcast is a public discussion held at LSE by the Forum for European Philosophy, titled Hive Minds: Collective Intelligence in Humans and Other Animals. The panelists are Christian List (philosopher, LSE), Elli Leadbeater (social insect biologist, Royal Holloway), and Larissa Conradt (evolutionary theorist, Max Planck Institute for Human Development). Leadbeater opens the discussion brilliantly, asking us to picture a swarm of honey bees who have just left a hive. So now they are clustering on a tree branch, with about three days to find a new home before they run out of food. 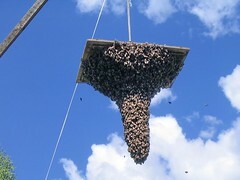 Scout bees fly off in all directions looking for nesting sites with certain desirable features – large but not too large, protected from the elements, free of ants, and so on. These bees fly back and report their findings through the famous waggle dance, and other scouts fly off to verify their findings. Gradually a consensus emerges. In this way, thousands of bees with no central decision-making authority prove to be surprisingly effective in choosing an optimal nest. This paves the way to discuss broader questions, such as, is there collective intelligence in bees and other social insects? If so, what is the evidence for it, and what form does it take? Do we also find forms of collective intelligence in humans? And what can humans learn from bees about the best ways to make collective decisions? The discussion encompasses philosophical questions (the nature of intelligence), historical anecdotes (Galton’s ox) and current developments (Brexit, Donald Trump). The queen cells had been torn down. A worker crawled out of a gaping hole in the side of a cell as I wondered who had given the order – a new queen or rebel workers? The old queen, Melissa, had disappeared in early June. Her last public appearance (to my mother) had been just before the May bank holiday. A week later she was mysteriously gone and a single, small queen cell on the middle of the frame – most likely an emergency cell or supersedure – had been left in her place. It wouldn’t have been a surprise if the workers had decided to supersede the queen. She was going into her third year and had been struggling to build up the colony after winter. This may have been because the spring was wet and cold, although I had constantly fed and kept the hive clean and warm, or it may have been due to nosema, because both hives had some spotting on the entrance coming out of winter. However, both hives had been treated accordingly with good husbandry and any sign of disease had been very brief and long since passed. All that being said, the fate of mine and Emily’s longest-standing colony had rested in a single, rather stunted, queen cell. It was like living on a knife edge for the next three weeks as I visited the apiary daily to feed the hives during a month of unsettled weather and patiently waited for the new queen to emerge and mate. 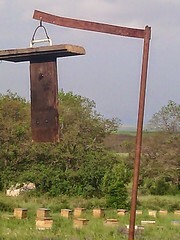 The June gap was very poor this year, in our area at least, and the feeders were drained dry of syrup each day with desperate tongues poking out below the rim at the bottom. On the last Monday in June the weather was fair for an inspection. 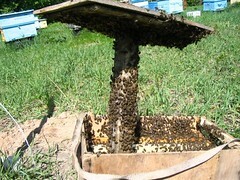 Peppermint’s colony had been growing steadily stronger and the queen had been spotted and laying well. As all seemed fine in our larger hive, I decided to check the nuc colony first and find out whether Melissa’s heir had emerged. 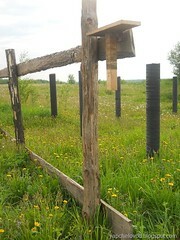 The bees were content inside the nuc. They were purring. Kitten bees. I went forwards and backwards through the nuc to inspect each frame twice. 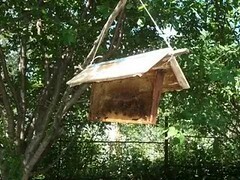 The queen cell was gone, but there was no sign of a new queen or brood. Every frame was packed full of honey on both sides. If a new queen was present and if she had mated successfully, she had nowhere to lay. Frame by frame, I carefully moved the nuc colony into a full-sized hive then closed up and fed syrup to help the bees draw out fresh comb on the rest of the frames. Peppermint’s colony was starting work on a super and I was proud of their progress after a slow start in spring. Going through the frames forwards and backwards, I couldn’t find the queen. The bees were as good as gold and shiny eggs at the bottom of cells suggested the presence of a queen at least three days ago. However, I did find four queen cells across two frames and one was still unsealed. A rainy Saturday had delayed an inspection till Monday – had I just missed Peppermint flying off in a swarm by a couple of days? I went forwards and backwards again through the frames in the hope of finding her and making an artificial swarm in the nuc that was now conveniently empty. The queen was nowhere to be found, although I could see the nest had doubled in size since my last visit a week ago. Perhaps it was supersedure despite Peppermint being a young queen in her second year? She too had been quite slow to build up the nest in spring. Swarm or supersedure: there was little point in worrying about it as it wouldn’t change anything. I decided to take out a frame with two of the queen cells and put it into my other hive. 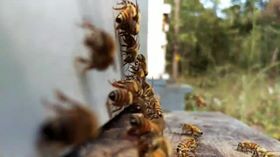 This might help prevent further swarming, if this was the case, in Peppermint’s colony and it might possibly help Melissa’s colony, if queenless, to requeen. 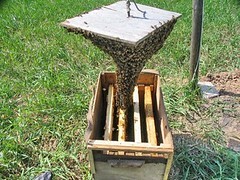 The next day I went back to the apiary to see whether Melissa’s workers had accepted the queen cells. If Emily and I were to lose our longest line of queens then I wanted to know for sure. The cells had been torn down suggesting that Melissa had left an heir or that the workers hadn’t been queenless for long enough to accept the new queens. It can sometimes take a new queen almost a month or more to get into her stride. This had certainly been the case with Melissa after she emerged in summer of 2014. I had been patient with both hives since March and with the colonies only now getting on their feet, I could be patient a little longer. It was a happy day in early July when I finally saw Melissa’s heir. A healthy patch of brood and eggs heralded her appearance when I saw her climbing across the comb. A long dark abdomen sprinkled in light gingery stars, she was very pretty. I couldn’t get a picture while holding the frame and so I put her carefully back inside the hive and closed up. After discussing with Emily, we decided to break the tradition of names inspired by essential oils and call the queen Patience because the bees had needed a lot of patience this year. And it seemed they would need to be patient a while longer. The following Saturday my mum, Ronnie, came to help with the inspection and to take a picture of the new queen. I went slowly through the small hive – it wasn’t difficult as the nest was still only five to six frames strong – and couldn’t find the queen, which was disappointing with my mum poised to take a photo. We smoked and cleared the bees from each frame looking through the hive again, and still no Patience although I did see eggs, larvae and sealed brood. I closed up the hive. Seven days later, yesterday in fact, I opened the hive again and this time found a cluster of queen cells in the middle of the frame. I was disappointed. The cells looked like emergency cells made and sealed very quickly, because they had certainly not been on the frames the week before. What had happened to Patience? How had she disappeared, or why had she failed, barely a month after she had emerged? I felt disappointed for my bees too. They had persevered to recover after spring and I had felt so pleased for them when I had seen Patience on the comb and the brood nest start to grow. But worrying would again change nothing. I let Thomas remove one of the queen cells at John Chapple’s request for a beginner’s hive which had gone queenless. I was glad at least to give one of our lovely line of queens to another hive. Inside Peppermint’s hive all was well. 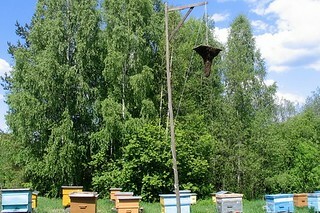 This week I had a small gathering around the hive of familiar and new beekeepers. Peppermint’s heir was spotted climbing over a frame and I quickly caged her to do some manipulations to the hive, which included taking a frame of brood and a frame of honey to donate to Patience’s former colony. I hoped this would help to sustain the queenless colony while waiting for a new queen to emerge. I could have marked the new queen, but I had just recovered from a small operation and was starting to feel like I had done enough beekeeping for the day. As I closed the hive, I decided to pass on Patience’s name to Peppermint’s daughter. It is too good a name to waste and it seems both myself and the bees will need a little more patience before the hives can be ready for winter. I’ve enjoyed every moment spent with my bees in spite of the challenges this season, though I’ve spent less time blogging about the bees in favour of spending time in the garden. That’s a story for another post. It’s no mystery that, at the age of 49, Sherlock Holmes retired to the Sussex Downs, gave up being a detective, and devoted himself to beekeeping. What we don’t know is what he did with all that honey? The enigmatic Mr. Holmes is unlikely to ever divulge the answer, though he did let slip some of it went in little pots to the house of Dr. Watson, as Christmas presents for the doctor and his wife. Sherlock himself was surprised to learn that honey can be used as a form of expression. Dorian Gray told Holmes about the artist Blake Little and his most unusual photographs, taken between the years 2012 and 2014. 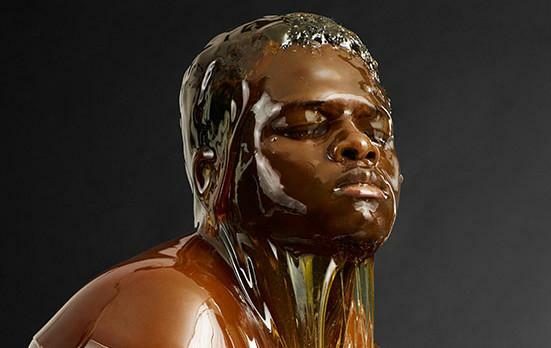 Mr. Little, a portrait photographer, used over 4,000 pounds of honey, drenching his subjects–including a dog–with the golden elixir then capturing their images forever. All of these delicious photographs, which have been compared to primordial beings trapped in amber, can be seen in Little’s book Preservation. Sherlock is a bit dumbfounded by the waste of it all. In his day one ate honey on scones, and was grateful for it. Ought the product of the industrious bee wind up exploited in such a decadent manner? Is this art or mere frivolity? And exactly how long does it take to wash all that honey out of one’s hair? Picture above credit to: Bee Somebody blog. Beekeepers are frequently asked about honey crystalizing, what it means, if it affects the quality, and what can be done to prevent it, and can it be reversed. 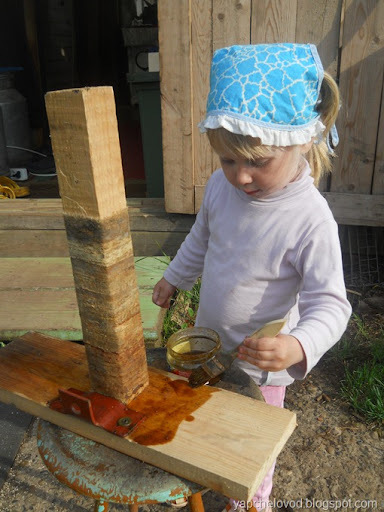 The short answers are: It simply means the sugars in the honey have come out of the liquid state and formed crystals. Honey is a product of the nectar of flowers which vary in their ratios of types of sugars. Nectars with high glucose to fructose ratios tend to crystalize quickly. Here in South Carolina cotton honey is often sought after however it crystalizes quickly, sometimes in just a couple months. Tupelo, on the other hand, may last years. Regarding quality, crystallization is not a reflection on quality one way or the other. In some countries crystalized honey is sought after and used as a spread. Crystallization is simply a process that occurs based on the ratio of sugars in the honey. To prevent or delay crystallization keep honey at room temperature or in a cupboard. 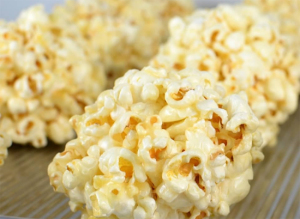 Never keep honey in the refrigerator which is close to the ideal temperature to promote crystallization. Finally, to reverse crystallization, simply place your jar of crystalized honey in a pan of warm water. The warming process should be a gentle and patient warming. I tell people to do this at night just prior to going to bed and they will wake up to a jar of liquid honey ready for use at their breakfast table. Never rush the process or attempt microwaving the honey or enzymes and other healthy properties are destroyed, or worse, plastic bottles can melt and contaminate your precious honey. More information can be from found on the web page Benefits of Honey.